James Broom was the son of Thomas Broom & Elizabeth Hannum. He and his wife Esther Willis were the parents of Jacob Broom. Both remain mysteries to some extent, even though we have a fairly good paper-trail for James. There is also quite a bit of conflicting and/or incorrect information in LDS and other internet records floating around, to add to the confusion. So what do we really know? When and where was James Broom born & was there a relationship to Daniel Broom as some have claimed? I have never found a birth record for James. In fact, there seem to be only two birth records for children of Thomas Broom, despite the fact that we know from both burial records and the settlement of Thomas’ estate that he had several more children. What we do have are the Monthly Meeting Minutes documenting James’ marriage to Esther in about 1740 and James’ mother-in-law’s will, written in 1743, naming daughter Esther Broom and grandson John Broom. This would place James’ birth date at or before 1720. It is at this point that one of the most quoted mistakes becomes extremely unlikely: the LDS record stating that Daniel Broom and Judith Calvert’s son James, born in 1726, was Jacob Broom’s father. It is not likely that this James married at age 14 and had a child at age 15 or 16. In addition, the Chester Monthly Meeting minutes, which also show the marriage of Daniel (in one reference named David) and Judith Calvert in 1725 and the birth of their children, also show a James Broom, presumably the child of Daniel & Judith, “marrying out” in 1756, long after “our James” was married to Esther Willis and living in Wilmington. What is interesting about the naming patterns of Judith & Daniel’s children is that the first son was not named after either grandfather (Daniel Sr. and John Calvert), but named James. The first daughter was named Mary. James and Mary Broom were two other Brooms in the area who had died young, in 1719 and 1721, not long after their marriage in 1713. And of course, we have Thomas & Elizabeth’s children, James and Mary, who had also been born some 10 years before Daniel’s children. Daniel’s third child was named Daniel and the last two, twins, were named Thomas & Elizabeth, the first names of our James’ parents. This could be coincidence, but could also indicate some more distant family relationship. It is presumably this third-generation Daniel who is “reported” for fighting, keeping loose company and neglecting meetings” in the Chester Monthly Meeting minutes of 1759 and for “drinking to excess and swearing” in 1760. In 1766 and 1771, there are bills settled for “maintenance” of Judith Broom, suggesting that husband Daniel had died before that time. In 1772, it was her son Thomas’ turn to be reported for “drinking and neglecting meetings”. These records indicate that the Daniel Broom – Judith Calvert family remained in the Chester area and members of the Friends at least through the mid-1770’s, while our Brooms removed to Wilmington in the late 1730’s and early 1740’s. 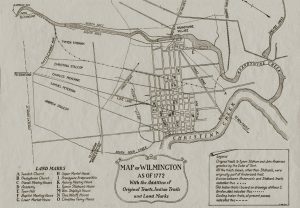 Additional evidence for Thomas & Elizabeth as James’ parents is the land in Wilmington which is passed from Thomas Broom & Elizabeth Hannum to son James, and which James in turn passes on to his children, including Jacob Broom. I have found no records and no will for Daniel Broom Sr., Jr. or III, or their children in the Wilmington area. “Our” James’ children carry on various family names, including Thomas & Elizabeth, never naming a child Daniel or Judith. We also have a record of the “Original Settlers on the Delaware”, in which James is listed as being 81 in 1794, also given as the year of his death. His residence is shown as Christiana Hundred. It looks as if James’ will was written in 1791, although this part of the document is smudged and circumstantial evidence would seem to suggest otherwise. Of course, many wills were made months or years before the time of death. The will was probated in 1794, which matches with the death date given on the list. The will also includes names of grandchildren born after 1791 and before 1794. There were no other Brooms in this area, so this is almost certainly “our” James. More likely than not, the 1794 year of death is also correct, since the list was made in that same year. But what about his age? Thomas & Elizabeth married at the end of 1711 and have a child named John recorded in the summer of 1713. This would make it a tight squeeze to have had a child in between. There are (at least) four possibilities: the age on the list is incorrect, the baptism record for John, born in 1713 was really James, the baptism of John took place a few months after his birth, and James was born shortly thereafter but not recorded for some reason, or James was born before John in 1712. According to a historian I had consulted on similar situation in another branch of the family, if Elizabeth had been pregnant at the time of her marriage, the child would quite likely have no baptism record, as that would highlight the fact that the mother was pregnant at the time of her marriage. This was apparently not uncommon in those days. In this case, his most likely date of birth is the summer or early autumn of 1712, and this fits a death at 81 in 1794 perfectly. On the other hand, it is also possible that James was Thomas & Elizabeth’s third child, in that case born between 1715 and 1718. If so, the age of 81 was not correct. Thomas’ first recorded son, John, apparently died in 1730, leaving James as the eldest son at the time of Thomas’ death in 1749, no matter what the original birth order had been. This seems to be borne out by Thomas’ will. 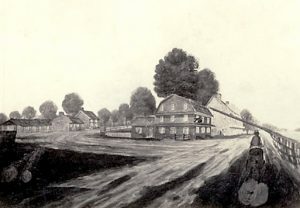 Thomas paid taxes in both Darby and Concord in 1715. 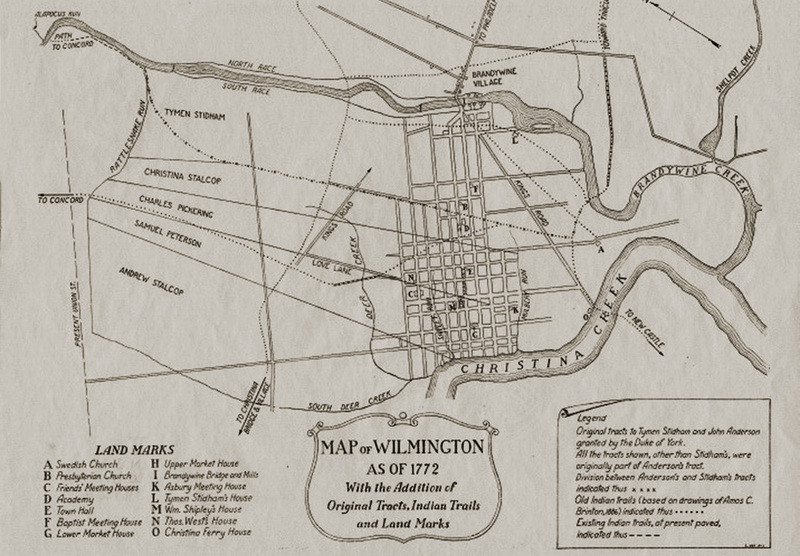 Since Thomas moved to Wilmington somewhere between 1728 and 1736, and the early children are both baptised and buried in Chester through at least the year 1732, it is fairly certain that James was born in Chester. Who were James’ and Esther’s children? Here we have another problem. Although there is no dispute about Abraham and Jacob, this is not the whole story. The conclusion that James and Esther only had two children has probably become prevalent because James leaves his estate to those two sons and names no other children or grandchildren who cannot be traced to these two. Making Jacob the first child also fit better to the Daniel Broom/Judith Calvert story, since that James would have been 25 or so when Jacob was born. However, we have the Quaker record and Esther Willis’ mother’s will which seem to prove that James and Esther married in 1740. The will also shows that they had a son John, most likely still alive in 1743. After that, there would seem to be a 10 year pause before Jacob and Abraham are born. This is unlikely in this period of history. However, biographies of Jacob make no mention of siblings other than Abraham, and James’ will mentions no other children. Looking further, we find a mysterious reference in the will of Jacob Taylor “Nayler”, written in December 1759. In it, he names “friends Esther, Jacob, Isaac and Abraham Broom” and makes James Broom and David Bush Jr. executors. David Bush was a nephew of James, his mother being James’ sister Ann. This connection adds to the evidence that James was Thomas Broom’s son. The Esther named in the will could either be mother Esther or a daughter named Esther. Isaac is interesting in that it certainly fits the biblical naming pattern of the children. However, there is no Isaac in James’ will or in subsequent generations. On the other hand, Isaac Taylor was Jacob Taylor’s father or grandfather, and his name is associated with the Brooms several times over the years. Interestingly, an Isaac Grantham signs a bond relating to James Broom’s estate, together with Jacob and Abraham. An Isaac Broom does show up in the Bucks Co. census in 1790, but it is not clear if there is a relationship. A cautious conclusion is that there was indeed at least one child in addition to Jacob and Abraham (John). There may have been more, including Isaac and possibly Esther, and perhaps unsuccessful pregnancies — or children who died very young — in between. Considering normal naming patterns to which Esther and James seemed to adhere by naming their first son John, one would have expected a Mary, Thomas and Elizabeth before starting on more arbitrary names like Jacob and Abraham. Jacob Way was James’ uncle, and another Jacob Way a cousin, which may account for Jacob’s name. It is fairly certain that none of the other children lived long enough to have families of their own. However, there is also a slight chance that the Isaac Broom of Bucks Co. is somehow related, but due to a falling out in the family, was excluded from James’ will. I tend to doubt this, but this too is a subject for further research. And what happened to Esther Willis? Also a mystery here. There seems to be no doubt that James Broom and Esther Willis were the parents of Jacob and Abraham. Esther Willis was the daughter of John Willis and Mary Webb, and granddaughter of Esther Brinton, for whom she was named. The Brinton and Willis families were active members of the Society of Friends. It is also fairly certain that Esther held to her family’s Quaker beliefs longer than the rest of the Broom family, up until her marriage. This idea is supported by the notations inn the Concord Monthly Meeting minutes, disowning Esther for her marriage by a priest. Despite her marriage by a priest, she may have been uncomfortable with this and this may explain the lack of birth records for her children, or records from this period may simply have been lost. Unfortunately, both the Campbell biography of Jacob Broom and the John Hill Martin’s History of Chester County contain numerous, proven errors and shed no light on what happened to Esther. Both Jacob and Abraham named one of their daughters after Esther, even including her surname Willis in both cases, which leaves little room for doubt about the name of their mother. 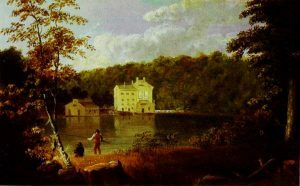 Abraham was born around 1755 and Esther was most likely alive at the time of the Taylor will in 1759. She is not mentioned in the will of her husband in 1791, so this would place her death somewhere between 1760 and 1790. What more do we know about James? The Campbell biography refers to James as “originally a blacksmith”. However, I have not found any documentation to support this except an ad placed in “The Pennsylvania Gazette” October 23, 1760 which states as an afterthought: “N.B. Said James Broom is removed from his late Dwelling house, to a three Story House, below the lower Market house, at the Sign of the Sloop, where he continues to keep Entertainment for Man and Horse, as usual, and requests his Friends, and others, to favour him with their Custom, which will oblige their humble Servant. JAMES BROOM.” Presumably the “entertainment for horse” included fitting the horses with shoes if necessary, and it is certainly possible that James learned this trade during his period of apprenticeship. In one census record, James is referred to as a “Gentleman”, suggesting that he also possessed a significant estate. James’ name appears several times in the Pennsylvania Gazette between 1750 and 1771, for varying reasons. The early ads concern the sale of Thomas Broom’s property, most likely including the tavern referred to in the text above. Several ads concern the sale of various pieces of real estate, one concerns a horse he has found, and others concern a horse that was stolen from him, a servant who has run away and a character reference for a friend who is apparently being unjustly accused of fraud. James wrote his will in 1791, if the date has been read correctly. Even magnifying the word really doesn’t give a clear answer. The will was probated in September of 1794. However, the will mentions several of Abraham’s children by name, including Harriet Rumsey Broom. Her obituary clearly places her birth between March 1792 and February 1793, which, in combination with the list of from Original Settlers on the Delaware giving James’ date of death as 1794, makes it likely that in any case, the correct death date was July 1794, and not 1791. What is certain is that at the time of his death, James possessed quite an inventory of property and sufficient funds to leave sizeable bequests to his two surviving children and grandchildren. Interestingly, only the two oldest of Jacob’s children are mentioned. Four of Abraham’s children are mentioned, all of the children who had been born prior to 1794. The instructions regarding Abraham’s legacy are also much more specific, something carried on in Jacob’s will, where he also includes bequests to Abraham and his children. 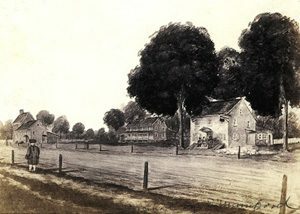 James leaves Jacob a house and some property located on Market Street between Front and Second St., and next to the house and property where James was living at the time he made his will. The will indicates that Jacob was living in that house. Abraham’s portion is willed directly to his children, with the provision that Abraham could make use of the income out of the property to “educate and maintain” the children until they were of age. Jacob was a successful merchant, politician and property owner by the time of James’ death, while Abraham was a military officer and had quite possibly amassed fewer worldly goods during his career up to that point. It is quite possible that these differences in status and occupation were the source of the differences in the bequests. Since James lived to such a comparatively old age for that time, Jacob and Abraham were already forty plus when their father died and fairly well taken care of themselves. Although it is difficult to determine the exact size of James’ estate without having an exact inventory, it would appear that he left significantly more to his children and grandchildren that he had originally received from his father, suggesting an active and successful working life.